Two thousand British Home Children/Child Migrants were sent to Canada in just three years, between 1908 and 1911 on the steamship Corsican. During those years the ship was chartered to the Canadian Pacific Steamship Company from the Allan Line Steamship Company Ltd. The 11,419-ton steamship was built at the shipyard, Barclay, Curle and Co. Ltd. of Glasgow, and launched in April 1907. She was used in passenger and cargo traffic between Canada and the UK. The Corsican was the identical sister ship of the Grampian and the Hesperian, both of which were built by Alexander Stephen and Sons. Up to this point in time, these three steamers were the largest vessels in the history of the Allan Line. 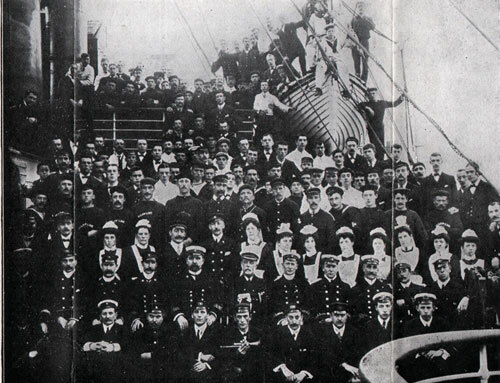 The Corsican’s maiden voyage, on 31 October, 1907 was from Liverpool to St. John, New Brunswick, a route she would remain on until early 1914. This passenger and cargo ship had a chimney, two masts and two propellers and was powered by two triple expansion steam engines, which allowed for a top speed of 16 knots. The passenger accommodations were designed for 208 First Class passengers, 298 Second and 1000 Third Class. The dining room of the First Class was at the front end of the bridge deck and had large, square windows on three sides to let in a lot of natural light. The ship had a silk-panelled music room and a smoking room with a large skylight made of teak on the promenade deck. The Corsican was equipped with electricity, a ventilation system for fresh air supply and a Marconi radio. In April 1912, passengers and crew of the Corsican suffered a terrible scare after crashing into the same field of icebergs in which the Titanic sank in. The captain immediately gave orders for the vessel to slow down and, steaming less than five knots an hour, the Corsican picked its way through the perilous ice, reaching St. John’s with all safe on board. They wired a message about to The Corinthian, who, it is supposed, passed it on to The Titanic. The Titanic hit the icefield a few days later. According to the Chicago Daily News, dated April 12, 1912, passenger Henry Pratt of Liverpool stated: “It was on Thursday night that we reached the (ice) field. I believe it was toward morning. The ship was going slowly at the time, for we knew that the danger was near. Immediately the captain gave the order, ‘Full speed astern’ and the ship hurled itself back from the massive formation that lay ahead. “No one knew when another might show itself, and the captain then gave orders to lay to for the rest of the night. Next morning we proceeded under low steam. All day, in spite of the bitter cold, passengers lined the rails watching the immense icebergs rolling down with the Labrador stream. An examination of the ship proved that no damage had resulted from the collision with the berg, but I shudder to think what would have happened if we had been trying to break the transatlantic record. 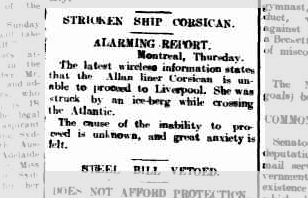 There are also reports of The Corsican hitting an iceberg later, on August 12, but with only slight damage. 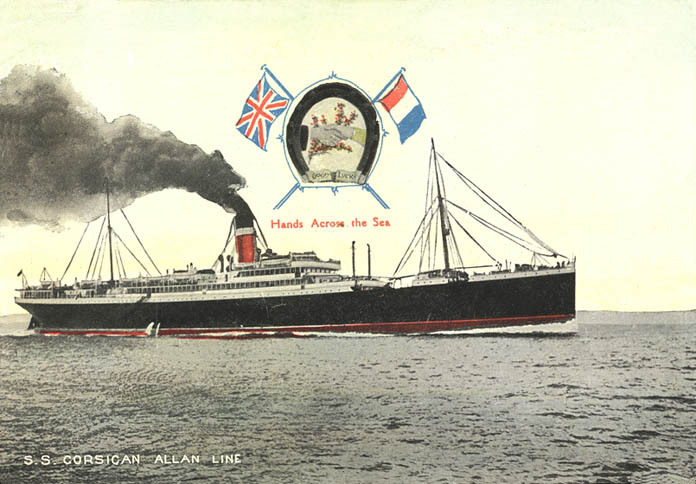 From April 1914, The Corsican made four Glasgow to Montréal roundtrips before being taken over as a troopship in August carrying troops from Southampton to Le Havre. She then resumed transatlantic voyages and carried, among others, the first Newfoundland Regiment to leave St. John’s for Europe on October 27, 1915, on her decks. During her military service, she became part of the property of the newly named Canadian Pacific Steamships Ocean Services Ltd. when the acquisition of the Allan Line was completed on 16 July 1917. On August 24, 1918, The Corsican re-entered its commercial service, on the route London-Quebec-Montreal and from 30 January 1919 she returned to the route Liverpool-Saint John. On 16 November 1922, The Corsican was renamed The Marvale and her passenger capacity was reduced to the third grade. Over the next three years, The Marvale served Canada from London, Glasgow, Liverpool and Antwerp. A major refitting in 1922 left her with a new passenger accommodation configuration (cabin/third). 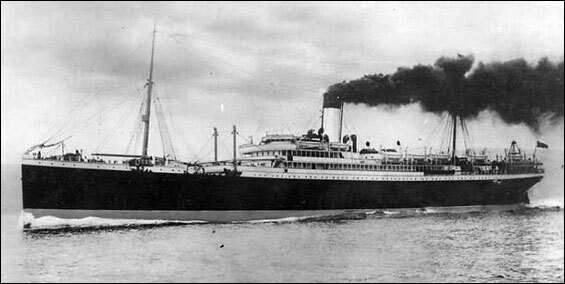 The Marvale’s final voyage, from Glasgow to Montréal by way of Belfast and Québec began on 26 April 1923. On 21 May, on the return leg of that trip, in a dense fog, she ran aground on Freel Rock, 32 km west of Cape Race, Newfoundland. Although the ship was a total write-off, all 437 people on board were rescued.